I have always felt that to have a perfectly tuned tempdb, we are supposed to have a number of traceflags and tuning. For many of my DBA friends, this conversation is no brainer. They create multiple files once they get into tempdb contention. I always felt this could have been automated as part of the SQL Server® best practices. Along with many new features in SQL Server 2016, we are seeing that the Microsoft® SQL product team is also enhancing existing features. If you are a seasoned DBA, it would be easy to recall the importance of trace flag 1118 and multiple tempdb files. Read this knowledge base article for more details. As soon as SQL Server 2016 is installed, the trace flags 1117 and 1118 are ON by default. This means that there is no need to add them in startup parameters. The functionality of the trace flag 1118 is to have uniform extent for every allocation in tempdb. This is the default behavior even without trace flag. 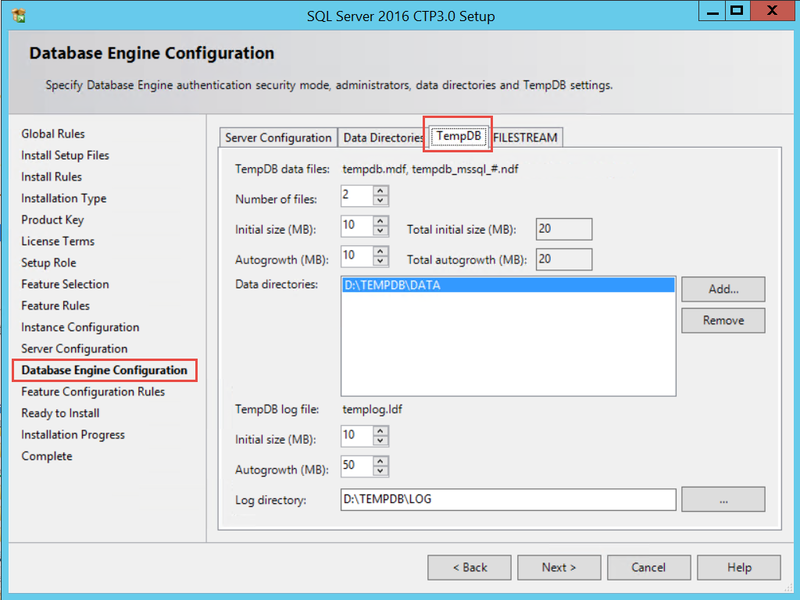 In SQL Server 2016, we have the option to specify tempdb file specifications during the setup. Most companies have a post-deployment script, and one of the steps is to optimize tempdb files. It’s a tab called tempdb under Database Engine Configuration. SQLTEMPDBFILECOUNT The number of Database Engine tempdb data files. SQLTEMPDBFILESIZE Initial size of a Database Engine tempdb data files in MB. SQLTEMPDBFILEGROWTH Automatic growth increment of each Database Engine tempdb data file in MB. SQLTEMPDBLOGFILESIZE Initial size of the Database Engine tempdb log file in MB. 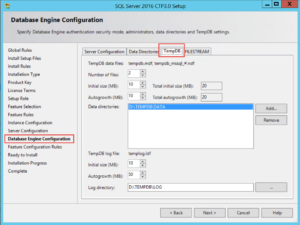 SQLTEMPDBLOGFILEGROWTH Auto-growth increment of the Database Engine tempdb log file (MB). SQLTEMPDBDIR Directories for Database Engine tempdb files. SQLTEMPDBLOGDIR Directory for the Database Engine tempdb log files. The SQL Server setup is smart enough to identify the number of CPUs on the server, and adds as many tempdb files as the CPU count, or 8, whichever is lower. In earlier versions, there was just one data file and one log file or tempdb database.